Imagine, having all the time in the world. To choose to work or not. To decide what salary you pay yourself, what car you drive, what home you live in, where you take holidays and how long. Anything and everything is achievable thanks to the seven subjects of management mastery. Just seven subjects studied over seven months, can transform any busyness and turn self-employment into true business ownership, where you own an asset that makes you money, even if you’re not there working all the time. These outcomes have been achieved by our clients since one client asked for our assistance to make this a reality in 2002, Since then we’ve refined it into a process so that any business owner can achieve a similar outcome. When it comes to business ownership we all want a fantastic lifestyle. We’d like the choice to work or not every day that our business operates. We don’t enter into business just to work hard for mediocre salary; we desire lifestyle choices, freedom, not continual concerns, stress, staffing issues or growth limitations. All of these all too common situations can be overcome permanently when you learn and master all the “Seven Steps to Business Certainty”. When you want great success you need to know why you are going to put the effort in to change your habits. Information on “How” to grow a business is easy to find, but having the reason “why” you want to use this information is infinitely more important. Information on sales, marketing, management etc has always been available in books, seminars or through consultants, more so now than ever. But you need to be certain on what you want the outcome of your business success to be before you will seek it out. 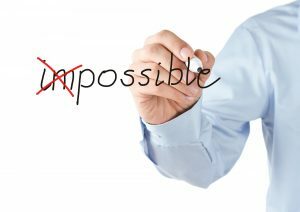 Ever heard of Napoleon Hill – the “Think and Grow Rich” author? He said, ‘whatever the mind can conceive and believe it can achieve’. So first of all, you need to conceive (i.e. plan) what it is you want, very clearly and specifically. By doing this effectively you start to believe in it, and only then you can achieve it. Commonly, business owners (from my own experience with clients) state their vision as, ‘I want more money and time’. This isn’t at all specific; it’s vague and unspecific. This is the exact reason why they won’t change habits, or have a reason to use what I can give them. Team building is the art of empowering people who work together to get to know each other more deeply. This creates a sense of camaraderie to bond to form a team who actually help one another, like a high performance sports team. Top TIP: Meet together weekly and have everyone talk openly about their week. This is one of the important keys of team building as it breaks hierarchy and the control that is counter to team work. Creating commitment to each person during the meeting creates accountability – a necessary process for teamwork to begin and is a necessary part of beneficial meetings. When employees work together they can be irritated by each other so clear communication is the way to overcome this common challenge. When the team members come together, talk openly and willingly they will bond more and become happier. Happier team members work harder and smarter and do more work for what you pay them, which turns into higher profits for the same salary costs, which increases net profits (without spending a cent), and makes your life at work easier and more joyful. After your team are bonding better you are ready to begin Measuring. Without the previous team building steps in place this step won’t work effectively. In every business there are major activities that are required. First of all, get sales, second carry out the work from the sale (call that production) and then third get paid for doing the work. This is what business is all about and to control and master each of these, to maintain balance (to avoid stress), measuring is the first major step. These three activities of your business need to be measured in various ways, but most importantly weekly in dollar figures. New sales won in $, will not be the same as production work carried out in $, nor is it the same as what has been banked; in nearly all businesses. Ideally all three of these figures of the business would be the same $ figure, but they never match. Measuring each of these areas creates opportunities to ask, ‘why is the figure what it is?’ for all that you measure, especially when compared every week. Questions come before answers so when you measure a lot of figures you create the opportunity for comparisons and a multitude of questions to ask and answer. Measuring creates obvious opportunities for improvement, so the more you measure the more profit you will start to generate. There is real magic in measuring and when a trained expert is giving you the tools to measure and by understanding you will find hidden profits lying dormant in your business. As well as profit opportunities to tap into, all without spending a cent to make you LOTS more profit! This subject is not the same as business planning, which can entail months of work, resulting in a large pile of paper that end up on a shelf attracting dust. When you measure weekly you discover some figures create awareness of situations which need specific strategies to improve what the figures show. For example the vast majority of businesses don’t have a high Net Profit Margin (the percentage net profit of turnover per year). As all businesses sell products and/or services for varying profit margins, if the business operates with a low net profit margin (seen on the P & L Statement) then this average profit margin means some items must be selling at a loss and others at a higher profit to have a low average net profit margin. When you understand how to measure the profit margin of all you sell (before it is sold, during production and then financially with a P & L), and see the figures of what makes you the most profit and what doesn’t as well as what loses you money – guess what happens? You make changes very quickly! When you see you are making zero, low or a negative net profit revealed by measuring you either stop selling the products/services at the price they are or you stop selling the products/services work completely. This is where strategies come into play. Without prior measuring you are always gambling with strategy choice and your strategy choice determines your progress in business. Effective business growth planning is about effective strategy choice (based on numbers from measuring) to achieve your business goals. Systems are the documented ‘how to’ that is the “BEST” way tasks needs to be carried out. There are numerous ways to carry out any task, but there’s only one “best” way. With team building (Step 2) continuing over months as well as measuring (Step 3) you and your team will identify the need for documented systems, seen by inefficiencies and inconsistencies that keep being seen by measuring. Measuring reveals the three areas performance of sales, production and cash flow. These areas and figures all are the result of your team’s work during the week. When you measure you will generally see inefficiencies, which when brought up in team meetings leads the team to see the need for systems. “That which we create we own”, is a great saying so getting your team involved in system creation means they will accept ownership of them and therefore use them! This increases net profit as it reduces lost time, mistakes, inconsistencies and unhappy staff who feel blamed for errors. By having systems to blame, it makes the team happier and empowers them to talk about systems during weekly team meetings. After all five steps are implemented – each of which creates more profit, you’re prepared for sales & marketing, to focus on growth. After monitoring your sales $ amount you may have realised your conversion rate was lower than you thought. Improved selling skills will increase conversion rates (sometimes massively) and therefore customers and turnover, which is great because you aren’t spending a cent more on advertising to get more customers and to make more money. 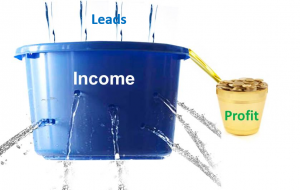 Think of conversion rates being similar to holes in a filling bucket of water and the water that’s coming into the bucket representing advertising that’s generating the inquiries. There’s not much point in turning on the tap harder to get more water into the bucket to overflow as profit. It’s far smarter to fill the holes so you retain more water – i.e. profit/money. The holes are the inefficiencies that exist in any business such as conversion rates, low prices, lacks of systems, no team harmony and many other situations. All of these are holes in the business bucket hurting profits (which is the overflow) and are easily fixed. Conversion rates can be improved very easily when you realise there are eighty plus possible strategies you can use to achieve this. Marketing is the process of getting customers in, buying once and then again in the future. Top quality marketing pre-sells prospects so they become ‘hot to buy’, even before you’ve spoken to them. The purpose of marketing is to generate too many inquiries, so your prices can be set at whatever profit margin you want because you aren’t worried about not having enough customers if you charge more. Marketing costs money and by implementing steps two to five you have surplus profit to invest on it, without being in fear of losing money on it. This is why marketing has to come at step six as businesses usually don’t have surplus cash to test marketing strategies to find out what works and what doesn’t, a very common thing with even top marketers in the world. Marketing is something you need to learn how to do yourself. Just because anyone can become a ‘marketing guru’ doesn’t mean they are a marketing guru! There are only a very tiny percentage of great marketers in the country, who get great results. Results are only what matter. Anyone who talks to you about marketing, without talking about how to measure profitable outcomes from marketing, is NOT a great marketer and you should avoid them like the plague. Great marketers have become great by spending tens of thousands of $ on learning from the best in the world and then tens of thousands on testing their own marketing on their own business to find out what works and what doesn’t. This is the only way to become great at marketing – through practical, street smart testing and measuring. This is what you need to do, but you can only do this when a lot of time on your hands to study, create, test and measure. That’s how you become brilliant at marketing and there are no short-cuts or ‘schools of theory’ that can teach you everything for nothing. The good news is, your rewards for learning great marketing are incredible and extremely profitable! Implementing all “Seven Steps” are what effective business management is all about. The “Seven Steps” are an exact, proven process of profitable business development. When you have happy, productive team members, held accountable in weekly team meeting where measured outcomes are discussed and the team become by-products of documented systems that are the “best” way of carrying out all their tasks, you have a business (and a team) that will begin to operate without you being in attendance all the time. When you implement all “Seven Steps of the Academy of Business Mastery Training” diligently you can set your business up to operate completely without you – as my clients over many years have personally experienced. There are seven ways to exit a business from hiring a general manager to selling it and five others in between. But why would you get rid of a cash generating machine that operates smoothly without you? This is brief look at the power of the ’Seven Steps of the Academy of Business Mastery Training‘ – the ultimate formula for business management that can transform your business and life by working smarter so that in less than twelve months your business can become a passive income generator that works hard… so you don’t have to! If you’ve received value from a few pages, imagine what Seven months of professional training, documented systems and support would do for your business! Our premier business transformation training course gives you everything you need to grow your business and enjoy a life of freedom. 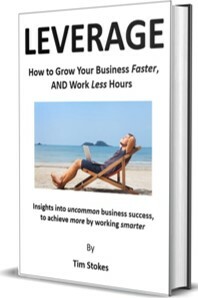 If you’d like a sample of the power of the Academy of Business Mastery just subscribe to receive the ground-breaking book LEVERAGE – and regular newsletters. You’ll gain fantastic insights from the book on advanced management strategies with actionable strategies. If you like what you read, you’re welcome to ask for a Profit Discovery discussion to see how all the 7 steps apply to your business, to transform it and your life.